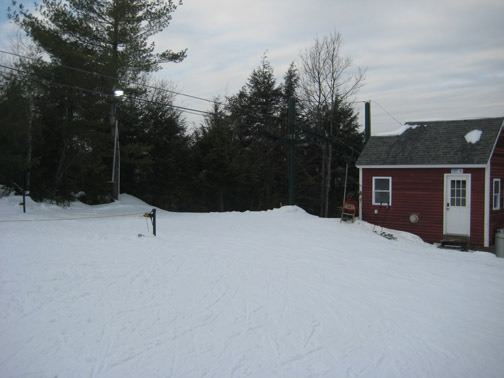 Blackwater is a private ski area which serves the school and other various high schools in the region, and is open to the public on a few occasions. Below is more information from Chuck. For official pages from the school, click here and here. For a historical video of Blackwater, click here. 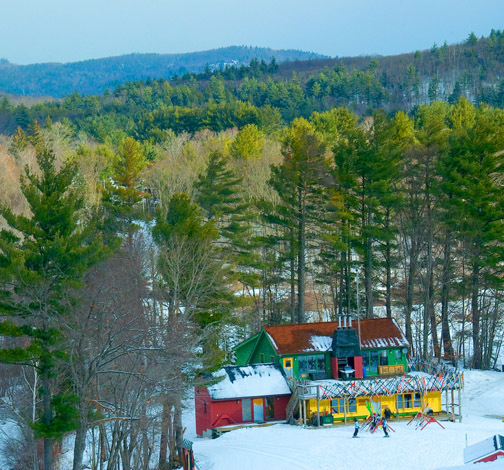 Cut in the mid-1960s, the Blackwater Ski Area originally operated with a 1500-foot rope tow, serving the students at Proctor Academy, in Andover. 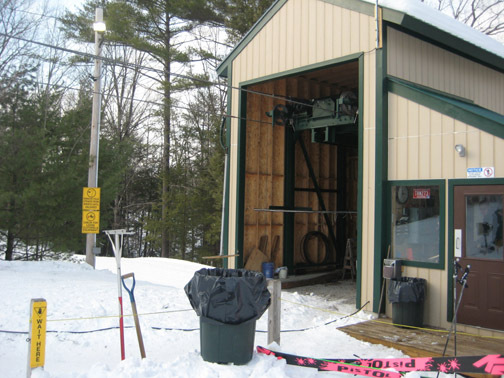 In 1970, the school purchased a used T-bar in Michigan, and installed it to replace the original lift. In recent years, that T-bar was replaced with a newer one purchased when King Ridge closed in nearby Sutton. 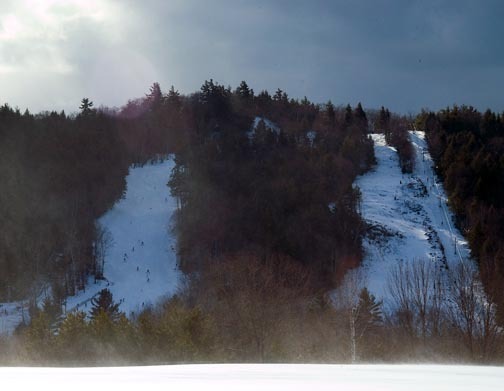 A new O’Connor lift provides access to the lower slopes and both 15 and 30-meter ski jumps, while providing a descent to the T-bar that services the top of the hill. 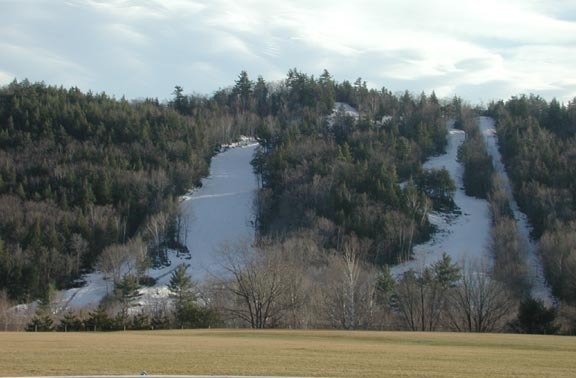 (Right - a view of the slopes from Andover. Another trail, not pictured, is located to the right of the T-bar). 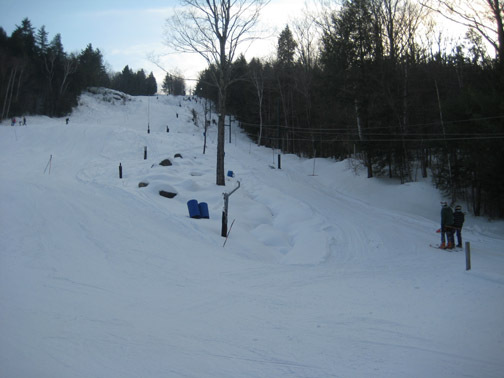 A view of the ski jumps and the handle tow, courtesy Chuck Will. Three trails with a 400-foot vertical drop descend to Yarrow’s Lodge at the base. 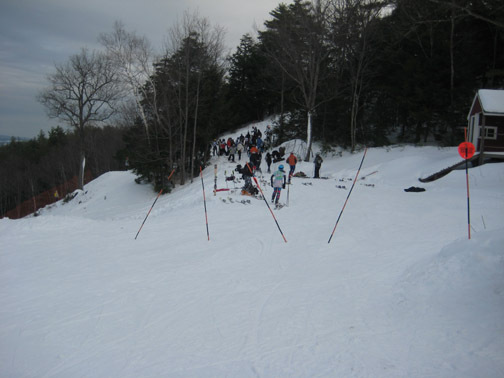 The Burden Trail, used for racing, the jumps and the T-bar feature top-to-bottom snowmaking and lighting. 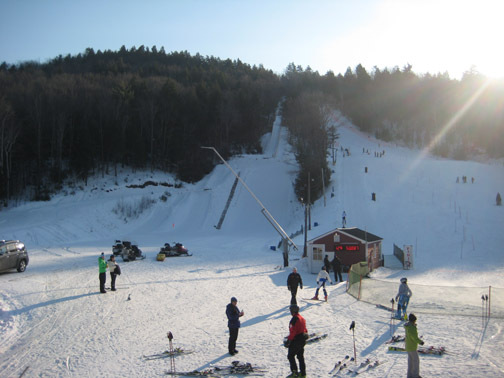 The Blackwater serves Proctor skiers and snowboarders, as well as several area high schools. 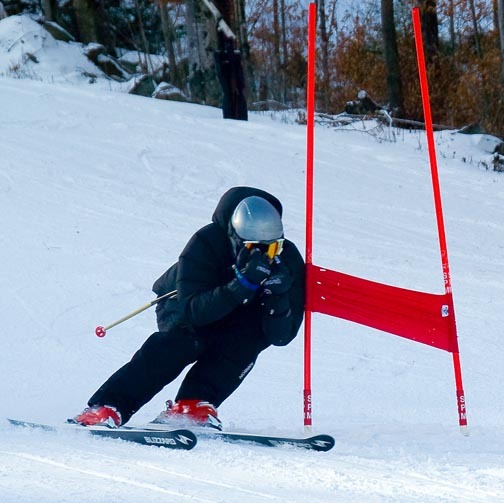 The site hosts interscholastic and Eastern ski competitions throughout the winter, including the prestigious Macomber Cup, which brings elite collegiate carnival teams to Proctor. A network of cross-country trails is accessed from the lodge, and is open to the public. Heated with two wood stoves, Yarrow’s Lodge features a full snack bar, flat screen TV station, restrooms, and a Ski Patrol facility. Located off of Lawrence Street, the Blackwater is easily spotted from Routes 4 and 11 in the central village of Andover. 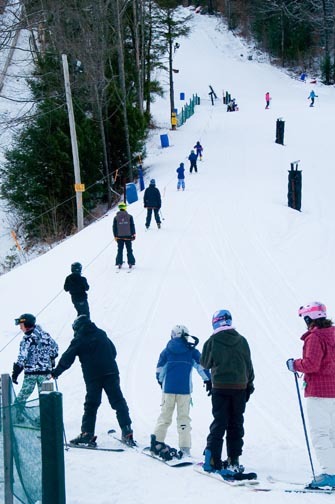 The pony lift taking skiers up a lower slope. At the top, they can ski to the right to access the T-bar. A racer passes a gate. 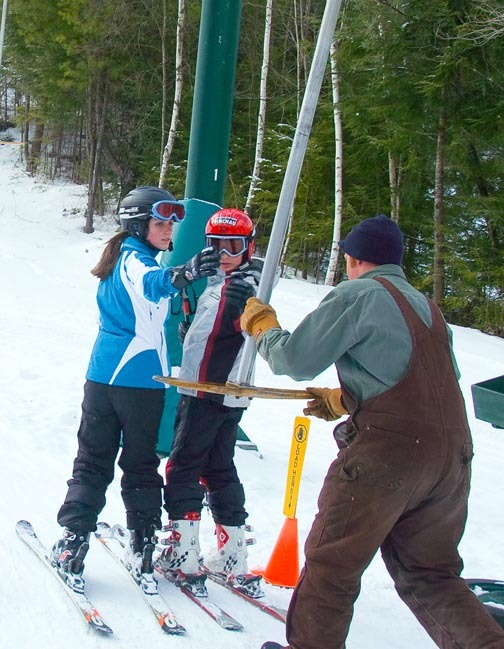 Skiers load the T-bar, which formerly operated as the Northside T-bar at King Ridge. Another view of the lodge. Racers and jumpers get prepared inside the modernized base lodge. 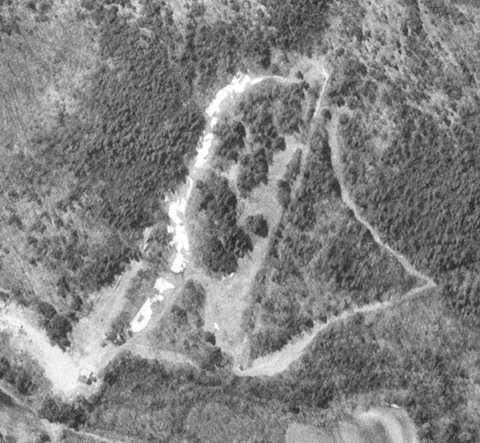 This 1998 aerial view shows the layout of Blackwater. The main race trail was the only slope with snowmaking at that time, and you can still see the piles of snow in this spring shot. The slope directly left (east) of the T-bar now has snowmaking and has been slightly widened. 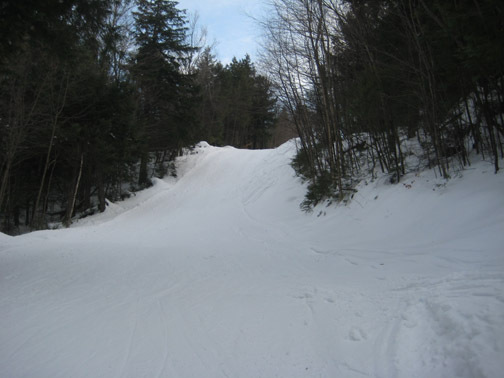 The far right (west) trail does not have snowmaking, but is a fun, twisting trail. I swung by the area in early April of 2002, and took a photo from Andover. The T-bar here was the original Constam that was obtained from Michigan. Also, compare this photo with the above, more recent photo from Chuck. You will see that the T-bar lift line has now had the ribbon of trees between it and the slope to the left cleared. On February 7, 2009, I had the opportunity to ski Blackwater and take the following photos. Many thanks to Chuck Will and Garry George, Hill Manager, for allowing me to experience Blackwater! I rode the Pony lift, and skied over to the T-bar. As racing was taking place on the Race Slope, I stuck to the far right trail through the woods. Conditions were great, packed powder with no bare spots. Drive for the old King Ridge Northside T-bar, all refurbished. Base of the T-bar, looking up the liftline. 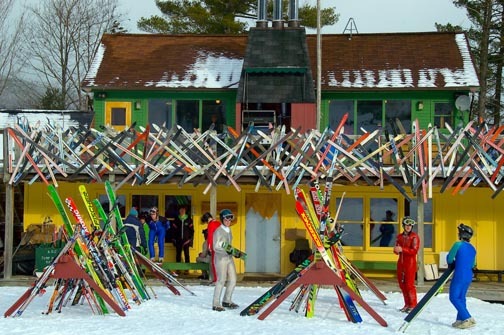 Unloading area of the T-bar. Racers line up at the top of the race trail. Midway down the narrow trail, just before a sharp right hand turn. 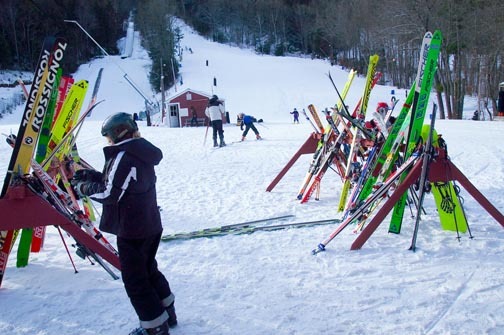 If you have personal memories of this ski area, just let us know.